“Physician heal thyself”. I must say, I sure do wish that I could have, but I’ll admit, I’m not that good. Not when it comes to standing up to the flu. Trust me, you won’t even be able to stand up (at least not for long). I know that the flu entails days of fever, nausea, headache, muscle aches and coughing. I planned to get my flu shot in October, just as I have in years past; but this year the flu had other plans. An early sneak attack. I will confess, I am not a good patient, just ask my family. No, on second thought, forget that. You just may find out some things about me I don’t want to share. What I will share however, is my thoughts and feelings about being a patient. I don’t like it. In the past I have pressed on through bouts of various maladies because I feel a deeply personal bond to each and every one of my patients. I have always been reluctant to take time away from my patients. I am the healer, I am the one they count on for resolution to their medical issues. I have the heavy weight of responsibility on my shoulders and I carry it willingly. Why? because I truly like being a physician. I am inherently aware of the trust that my patients place in me, and I am both honored and humbled. In the past I have ignored some of my own health issues in a misguided effort to provide the continuity of care that my patients have come to expect. What I did not always realize was, my patients expect me to be human. While I was at home, feverishly lamenting what I felt was my abandoning of my responsibilities to my patients, I came to the realization that, ok, sometimes doctors need care themselves. In the past I have been notoriously unwilling to accept illness in myself, often refusing to even admit that I didn’t feel well. My sense of duty to my patients is powerful, and it overtook my sense of reason. That was, and is, a bad idea. I took some time off to take care of myself, and I will be more vigilant in the future about doing so. I will take care of me so that I may continue to take care of my patients. Apart from my family, what I value most is the doctor-patient relationship that I have with those who entrust me with their care and the care of their families. My medical training gave me the knowledge and skills to be a healer, but my interpersonal relationships have taught me how to deal with patients more effectively and efficiently. I am grateful for the opportunities that I have been given, and oh so thankful that the flu symptoms finally resolved. So now you know what happens when the doctor gets sick. We get the flu just like anyone else. Yes, days and days of chest congestion, fever, sneezing, coughing, nausea and muscle aches. 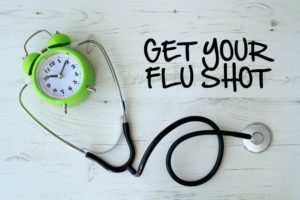 Would getting my flu shot sooner than I planned have made a difference? Maybe. So, some words of wisdom from one who cares. If you get the flu, stay home. Keep away from others to prevent spreading the illness. 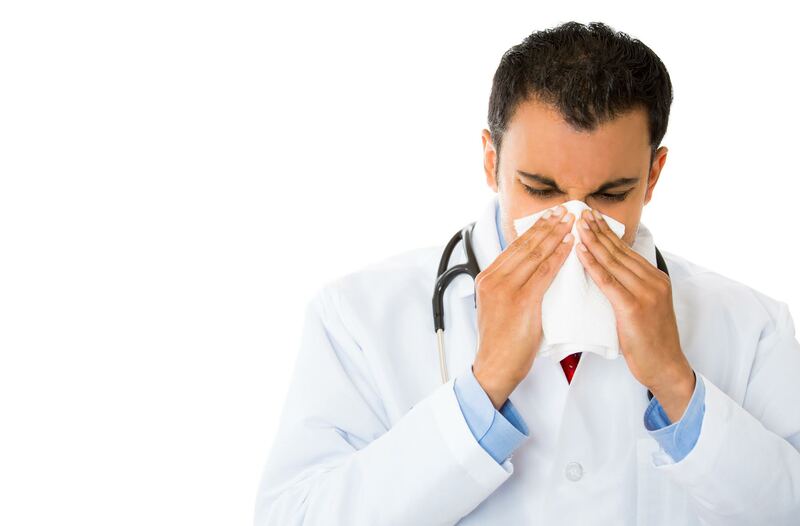 Seek medical attention, keep your sneezes and coughs covered and wash your hands frequently. It is not too late to get a flu shot if you haven’t already done so. Speaking as one who has been there, you don’t want any part of this flu bug! I’m back on track, so contact us for all your podiatric and wound care needs. We are here to help.